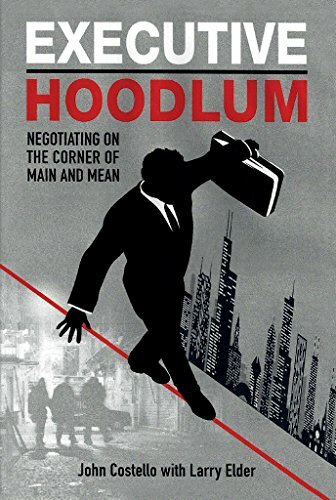 Executive Hoodlum follows the true life story of John Costello where he uses his harsh upbringing to move up the corporate world. What inspired you to put your story into a book? 1. I wanted to pass on the story to my kids so they have an appreciation of their legacy. Why they enjoy certain privileges, and to make certain they remain humble knowing the sacrifices that sometimes need to be made to succeed in life and for the next generation. 2. As a volunteer boxing trainer for under-privileges kids I was able to give something back to my community. It was personally rewarding to me so I wanted to give something back in a bigger way. That is to reach a larger audience of would be under dogs to demonstrate they have the opportunity to succeed no matter what the circumstances. 3. I wanted to relieve the burden of my own guilt pertaining to the last words I spoke to my mother before she died. Those words haunted me for decades. I never reconciled my differences with my father prior to his death either. We were at terrible odds as usual but he was alive long enough to make an attempt at reconciliation but chose not to, not with me anyway. Consequently I do not carry the same guilt as with my mother. I did write most of the book and long overseas plane trips and found myself crying writing a couple chapters. Now that the truth is out there, I somehow feel better. Best Selling author Larry Elder is the one who put the book idea in my head as he is a friend for about ten years. In fact, he was originally going to be my ghost writer. However, it was decided the book had to be in my words due to my slang and other vernacular to be authentic. With my busy work schedule, I was going to drop the whole thing. Problem being, I hate to start something and not finish. Technically Larry inspired me to write as he brought up the original deal as described in my acknowledgements. Prior to beginning the effort in earnest, I contemplated the above three reasons. Note – I never intended on writing a book because I would have to relive things in my life I was successful in suppressing. However, age and maturity helped me become more open with my early family life. Additionally, there are individuals in Chicago, New York and New Jersey that I did not want to have to deal with when it comes to some of the content. These are friends I have maintained and kept in contact over many years. I personally spoke to each person, mob boss, made guy, associate and the outlaw biker leaders individually to let them know my intention. To my surprise, to a person they noted they respected my street savvy enough to give the thumbs up. The characters in this book were well developed and interesting. How close did you stay true to real events and what did you take liberties with? Thankfully, I did not have to manufacture any drama. The one upside to being born a Costello! I’m not a big fan of fiction. Truth and authenticity are of utmost importance. This stems from certain things I know that have been portrayed in both books and movies about people I personally know or knew, that were embellished. John finds himself surrounded by constant turmoil with gangs, members of the underworld, murder, suicide, and drug addiction. What was the hardest thing for you to write about? The ugly truth of my own family, especially the circumstances of deaths of my mother, brother and cousin. There are many entertaining stories I was reminded of by friends I did not include in this book. Consequently, there may be a part two. Meet John Costello, Vice President of Business Development and Government Relations for Microsemi Corporation, a $6 billion leader in the advanced-semiconductor market. Well known and respected in the industry, John Costello graduated from college in 1983 with a degree in Business Administration. John’s social circle includes high-level corporate executives, politicians, military leaders and movie stars. As a young boy he played Little League baseball and Pop Warner football, and went on to become an outstanding track and cross-country runner in high school, captain of his college rowing team, and an accomplished boxer in the Golden Gloves and other tournaments. With this wholesome All-American resumé, most would think that John Costello emerged from a solid middle-class family with all the usual privileges pertaining – though nothing could be further from the truth. Costello was born into a working-class neighborhood on Chicago’s north side and grew up under quite difficult conditions. His father was a talented Italian tenor with mob connections and a proclivity for violence; his mother, the daughter of an Irish street cop, was a straight-laced Catholic girl till she took to the bottle after falling victim to that violence. Surrounded by constant turmoil and hardship involving gangs, members of the underworld, murder, suicide, drug addiction as well as physical and emotional abuse, John eventually transcended his circumstances to obtain a higher education and pursue a profitable career that entailed all the perks of an executive lifestyle inclusive of the Hollywood party circuit. Readers who might enjoy this book are those interested in true-crime stories, mob activity, murder and mayhem, as well as anyone seeking a no-holds-barred story that describes the resilience of the human spirit. Spiced with wit and humor and distinguished by the inimitable voice of tough-talking John Costello, his story touches our hearts while keeping us on the edge of our seats. Other comparable books include The Truthbook: A Memoir by Joy Castro, which describes a similar childhood fraught with abuse and dysfunction. The theme of destructive behavior and personal downward spiral in the fight game and mobster milieu is also taken up in Raging Bull by Jake La Motta. Then there is the true-crime and gangster activity to be found in Family Secrets: The Case That Crippled the Chicago Mob by Jeff Coen, as well as in The Neighborhood Outfit: Organized Crime in Chicago Heights by Matthew Luzi. All these works taken together give some idea of the scope of John Costello’s life as recounted in his own book. And that is what makes our book “unique” – John Costello’s life is unique. It has been a strange blend of two distinct worlds, but with one foot firmly emplaced in each. The fact that he is comfortable meeting with Senator John McCain in the morning to discuss government business, and can then enjoy the company of old friends from the streets of Chicago in the evening, is indicative of his parallel lives and will certainly be something readers find highly intriguing. We have an extensive collection of family photos, newspaper clippings, death certificates, court papers, and other supporting documentation for all claims made, as well as music recordings and video that would introduce the amazing voice of Johnny’s father to a whole new generation.